The layout returned from its Bournmoor expedition in the cars of two of the Group members - which were unfortunately parked some distance from the destination at Wilmington. Many hands made light work, and the parts were rapidly brought inside, then we adjourned for an extended tea break. 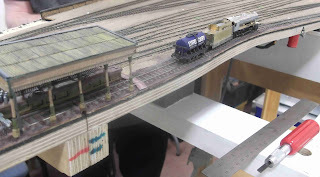 The basic layout was quickly erected - we are getting quite proficient at this. Keith had forgotten his list of things to fix, but Richard produced a copy from his iPhone. First item on the agenda was trimming a wall which extended too far, making it difficult to fit the end warehouse in place. Using his experience as a carpenter in a previous life, David S estimated how much needed to be removed, then attacked it with a hacksaw and removed what we hope is the excess. Return of Scenery Box 4 sometime in August will prove whether we got it right. The bit we removed has been carefully stored in Scenery Box 2, in case we need to stick it back again. 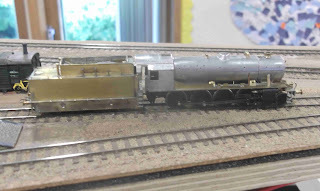 This month's slightly implausible visitor - an unfinished WD 2-8-0 from Keith. 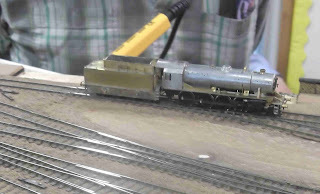 Whilst it might perhaps make a legitimate appearance as a trip loco, we used it as a shunter to check all the trackwork. Pete K removed surplus ballast from below the dairy, allowing it to sit flat against the baseboard, then clearances were tested and the milk tanker was pushed in and pulled out without hitting anything. 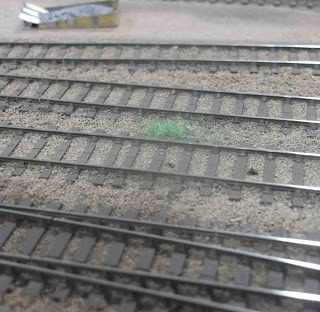 The track alignment at the joint at the back of the baseboard needed fixing. 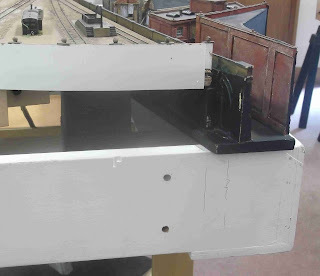 Track was checked with a roller gauge. 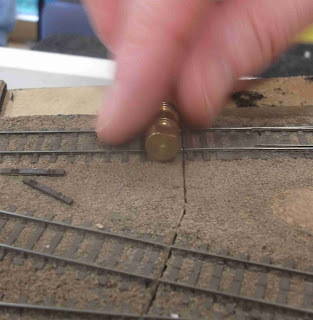 David S then spent some time bending the track to shape and resoldering as required. 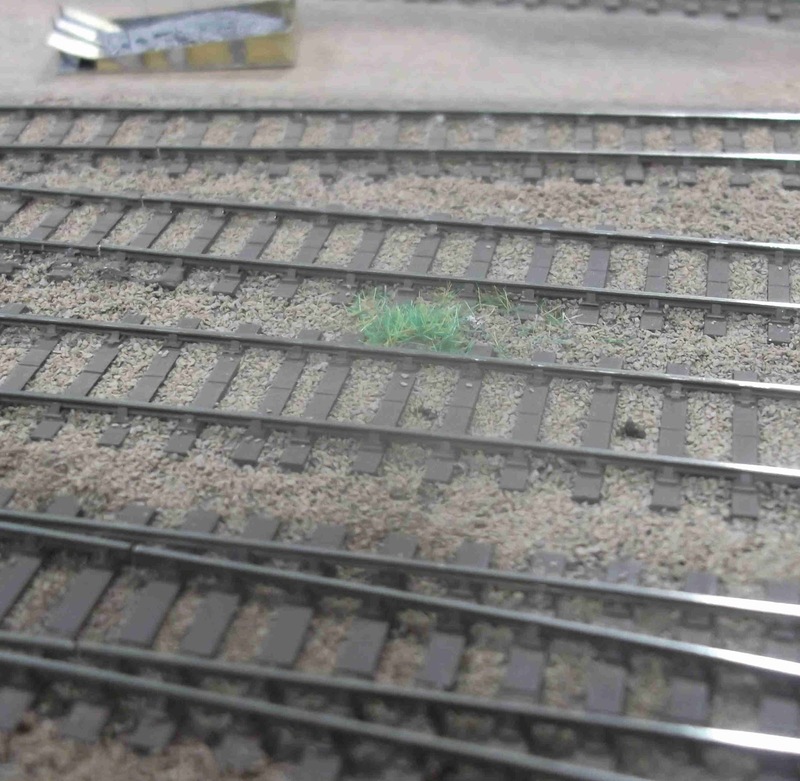 An experiment by Keith - adding static grass as marker for the position for an uncoupling magnet. to be fastened to the baseboard (by as-yet undecided means) to provide a secure resting place for one of the new MERG controllers when not in use.